It was a spring Sunday afternoon, and it shouldn't have snowed. It really shouldn't have. It wasn't in the forecast. And it wasn't winter, dagflabbit. But the gloomy rain that was pelting the windows of the sanctuary in the morning was by noon a sloppy mix of sleet, hail and flakes as a little group of stalwarts stuck around for our post-fellowship-hour discussion and study. By the time I was finished up with my last bit of pastoring of the afternoon, the snow was coming down hard. Though the ground was warm from the balmy day that had come before, the huge wind-blown flakes were hitting the ground so fast that they were piling up, one on the other, faster than they could melt. The snow gathered on the grass quickly, but as I looked out at the road, it was gathering there, too. It was also piling up on my motorcycle--which was, as it always is on days when there's no frozen precip in the forecast--how I'd ridden the thirty seven point five miles to my church. Hmm, thought I. This could be a little dicey. I wandered out to the snow covered two-lane, and performed a traction test. It wasn't ice underfoot, but the Slurpee falling from the heavens didn't exactly provide an adequate surface for two-wheeled riding. For the time being, it was a no-go. And so I waited, and contemplated my options. During that contemplation, other offers came in. Congregants offering cars to borrow, or places to lay my head. Neighbors offering dinner. I added those kindnesses to the options hopper, and watched the skies and the temperature. I know winter riding, and the way to do it safely. Part of that is experience, and part of it comes from having sat at the knee of masters and studied their teachings. 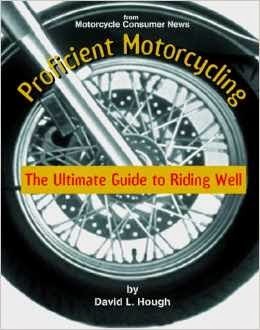 The best of the books I've read on the art of motorcycling is David Hough's Proficient Motorcycling. It's the book for riders who love to ride, year 'round, no matter what. We are the ones who couldn't care less about wheelies or stoppies or blowing by you at 135. We don't care about chrome and shine and leather chaps. We want to ride, and to ride safely and well, so that we can ride longer. It is the Wisdom Literature of motorized two-wheeled transit. Hough deals at length with how to approach inclement conditions. Wind and intense desert heat, rain and subfreezing temperatures? You name it, he teaches it. I've had a chance, over my 25 years of riding, to put many of his recommendations to use, and they've been remarkably effective. I have appropriate all-weather gear, and a well-maintained bike. Those are steps one and two. A compromised bike or rider sets you at a disadvantage from the git go. But for snow? Well, first, you gotta know when to fold 'em. Icy surfaces mean you stay where you are. Period. You have to have some way to maintain a trustworthy contact patch, either on dry powder or by pushing through slop to road surface. But ice? Ice means you're going down. There are other rules, assuming a road surface that is suboptimal but viable. You have to keep the speed down. You have to stay loose, and be ready to respond appropriately and rationally to traction loss. You have to use microconditions to your advantage...like riding in the tracks of the vehicle ahead of you. You have to know your abilities and road conditions in a bluntly objective way, devoid of ego or machismo. That's hard. If you can realistically sense a probability of Bad Things Happening, it doesn't matter how much you'd like to prove yourself as a rider. So I patiently watched it snow, for an hour, and then for two. I watched as the snow turned to mostly rain, and the road cover became grey and permeable slush. I checked road surface conditions out front of the church. The change came. The road surface was viable. The precip was different. I could tell that I was a go. So go I did, after sweeping the snow off of the seat and the controls. And yes, it was a bit more technical than my typical ride, and required more focus. It was cold, and sloppy, and surprisingly enough, I was the only motorcyclist out there. But at no point did I ever feel out over the edge of my limitations. A person's gotta know their limitations, as it is written in the Book of Clint. Gender neutral New Revised Standard Version, of course. In motorcycling as in faith, it's equally important to know how to blend experience and the teachings of wise elders to get something done.